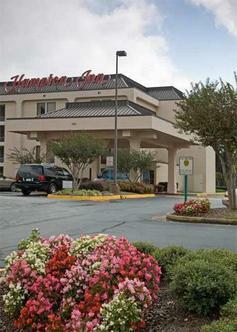 Whether you are traveling for business or pleasure, experience the best of southern hospitality at the Hampton Inn Atlanta Airport Hampton Inn Atlanta-Airport is conveniently located adjacent to Hartsfield-Jackson International Airport and southwest of downtown Atlanta. We are 2 1/2 miles from the Georgia International Convention Center, 4 miles from Atlanta Expo Center, and 15 miles from Six Flags Over Georgia. Other Atlanta attractions including the World of Coca Cola, Underground Atlanta, CNN Center, Georgia Dome, Turner Field, Phillips Arena, and Georgia World Congress Center are less than 10 miles away. Our hotel is surrounded by restaurants featuring quiet sit down dining or casual family friendly environments. Within 1 mile you can dine at a variety of local and nationally known restaurants such as Ruby Tuesdays, Red Lobster, Longhorn's Steakhouse, Joe's on Sullivan, Spondivits, and the Feed Store. Our hotel offers 128, comfortable spacious rooms, an outdoor pool, and onsite fitness center. Complimentary shuttle service is available to Hartsfield-Jackson International Airport, the Georgia International Convention Center, MARTA train station, and local area restaurants within a five mile radius of the hotel. Our hotel features all of the great Hampton amenities: hot breakfast bar, free USA Today newspaper, in-room coffee maker, free local calls, hairdryers, iron and board, phones with data ports, and 25'' TV with cable. Mini-microwave and refrigerators are available in select rooms. We also feature free high speed internet access in all our guest rooms and wireless internet service in our lobby. Our business center includes a computer with free high speed internet access, printer, tv, vcr and dvd player. Laundry/valet services and meeting/boardroom facilities are available for a nominal fee.